Since the Welsh Government announced its proposal for opening up a significant part of the Cardigan Bay Special Area of Conservation to scallop dredging, there has been a lot written in the media about likely impacts upon the bottlenose dolphins, reflecting both sides of the argument. 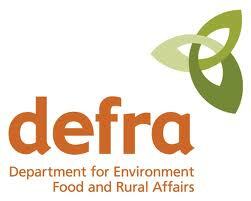 Unfortunately there has been a lot of misinformation, or simplistic conclusions reached. 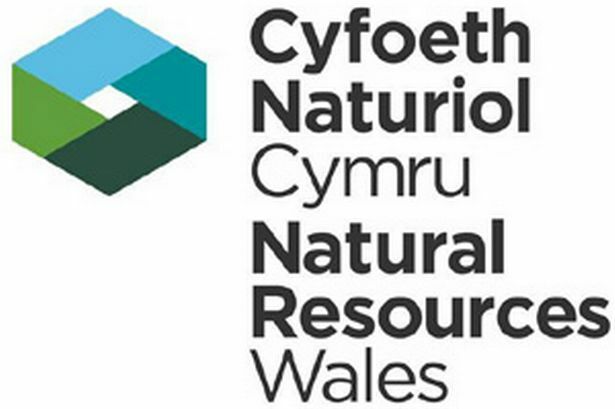 Sea Watch has been monitoring the dolphins in Cardigan Bay over the last fifteen years, on behalf of the Countryside Council for Wales/Natural Resources Wales, studying abundance trends, habitat preferences, feeding ecology and behaviour. Can scallop dredging adversely affect bottlenose dolphins? Potentially they could if dredging over the sea bed causes more than just temporary damage to the animal communities dependent upon it. Bottlenose dolphins in Cardigan Bay feed upon a variety of prey. Most of the time during summer when they may have young calves, they feed off or close to the sea bottom, taking demersal or benthic fish. Species known to be taken include flatfish such as sole and brill, gurnards, sandeel, and conger eel. At times, however, they will also take fish living higher up in the water column such as salmon, sea bass, garfish, and mackerel. Those fish are less dependent upon the seabed. An indication of what type of prey they are feeding upon can be gained from their group formation and behaviour. When they are feeding solitarily or in small groups, making fairly stationary dives and retuning to the surface near where they dived, they are probably taking demersal or benthic fish whereas in larger more mobile groups, they are more likely to be chasing pelagic open water prey. Do bottlenose dolphins occur equally everywhere in Cardigan Bay? No they do not (see figure 1). Densities are much higher in certain areas, particularly in the coastal zone around headlands and reefs. 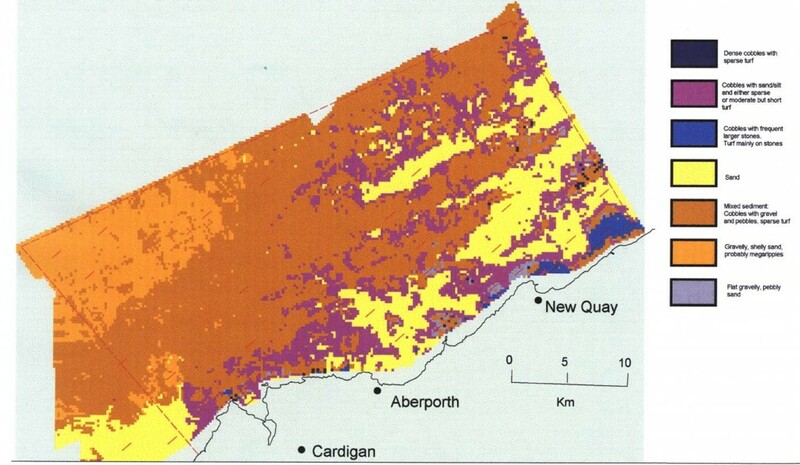 Within the Cardigan Bay SAC, this also applies so that the area within 3 nm is used in particular. However, they do also regularly occur offshore (at least to 6 nm), and in some years more so than others. This applies more to the area in the eastern offshore sector of the SAC than the western offshore sector. Habitat modelling indicates that in summer they have a preference for shallower waters (less than 30 m depth) and for areas of mixed substrate – fine sand and cobble reefs (see figures 2 & 3). Areas with gravel, pebbles or shelly sand appear to be used much less. We believe this reflects the fact that they have less diverse benthic fish communities. 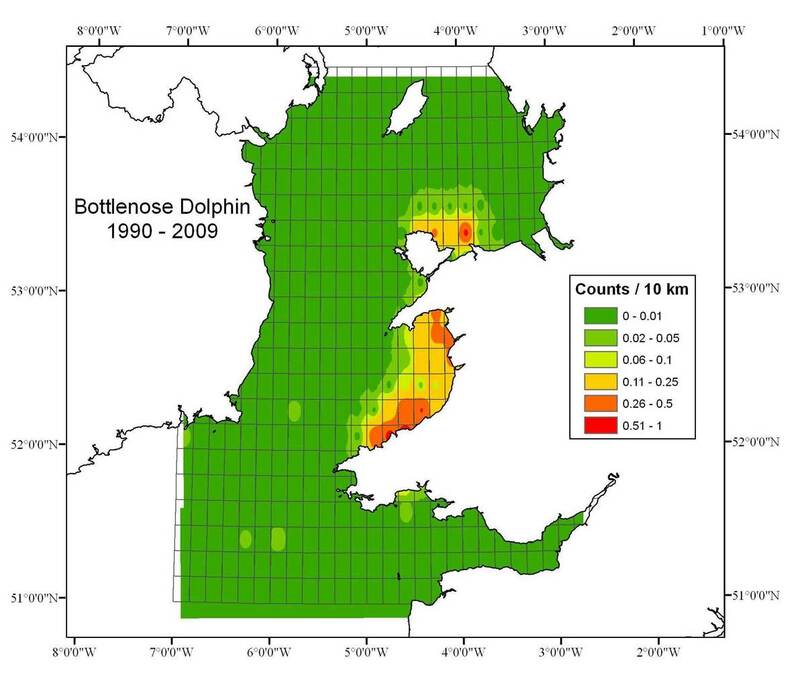 Figure 1: Bottlenose dolphin distribution in Wales. From Baines, M.E. & Evans, P.G.H. (2012) Atlas of Marine Mammals of Wales. 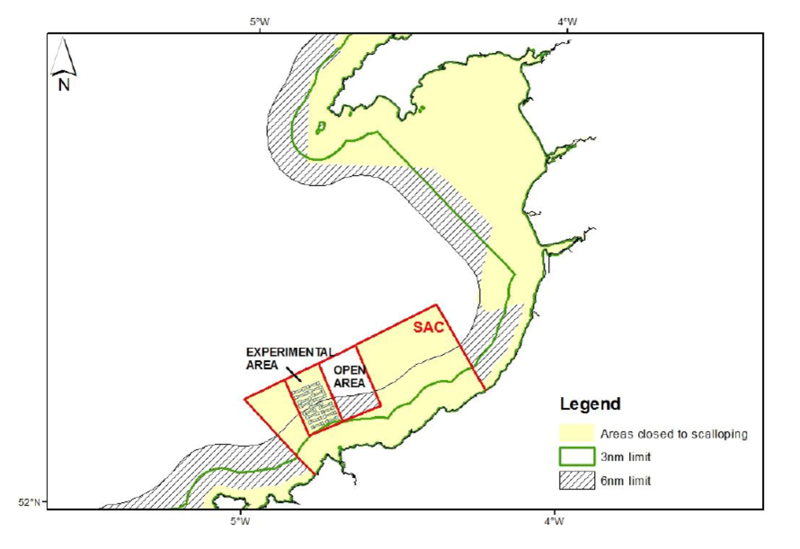 Figure 2: Bathymetry of Cardigan Bay SAC. The bottlenose dolphins favour the shallower areas in the coastal sector but extending offshore in the northeastern sector. Has the population size of bottlenose dolphins changed over the last fifteen years? Yes it has. Up to around 2008, the population was stable or increasing. 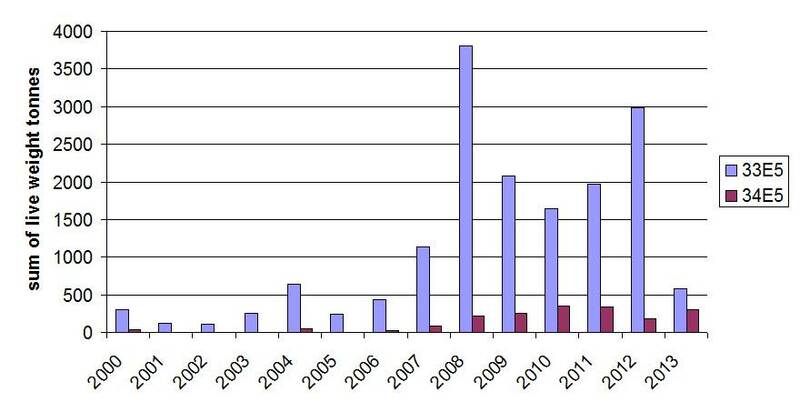 Since 2008 it has been generally declining (see Figure 4). 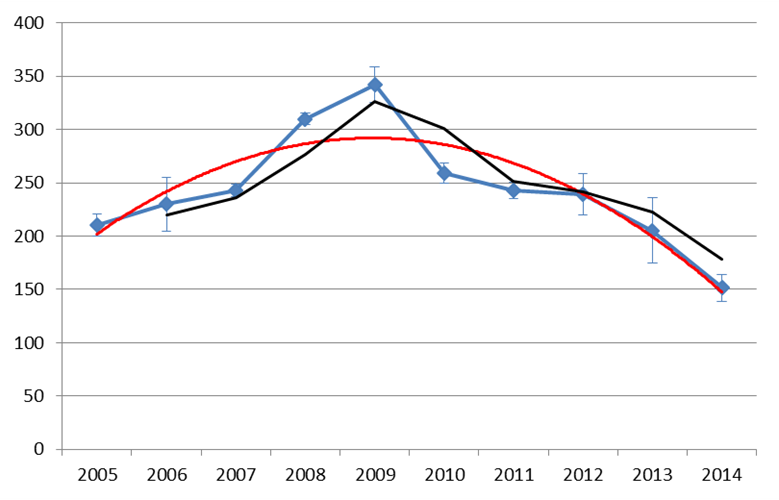 Although they may fluctuate from year to year, birth rates within Cardigan Bay SAC were lowest in the summers of 2008 and 2009 (see Figure 5). 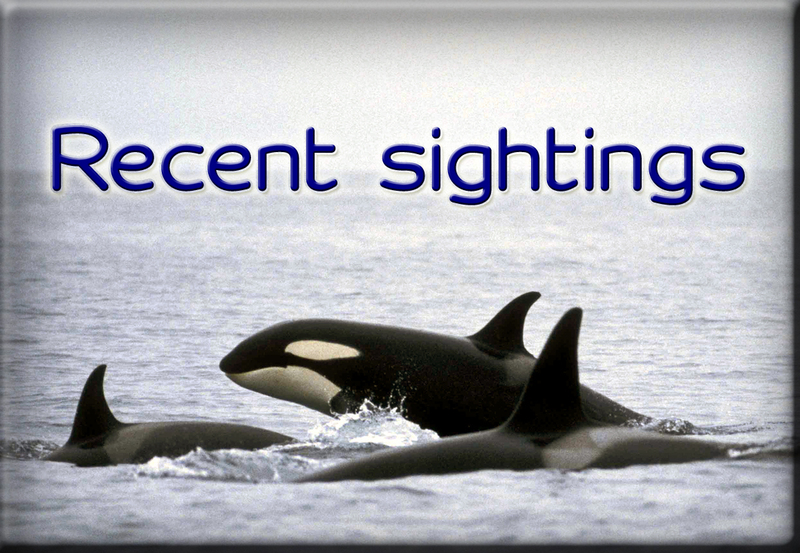 In recent years, recognisable individuals once using the SAC appear to have vacated the area and are now seen only elsewhere (increasingly outside Cardigan Bay altogether). Although these changes coincide with the increase in scallop dredging (initially occurring even within the coastal sector) (see Figure 6), we cannot say these are directly related. It could be due to natural changes in food availability or to the increasing evidence of disturbance related to the rise in recreational activities in the area. Or it could be a combination of all these. At present we don’t know. 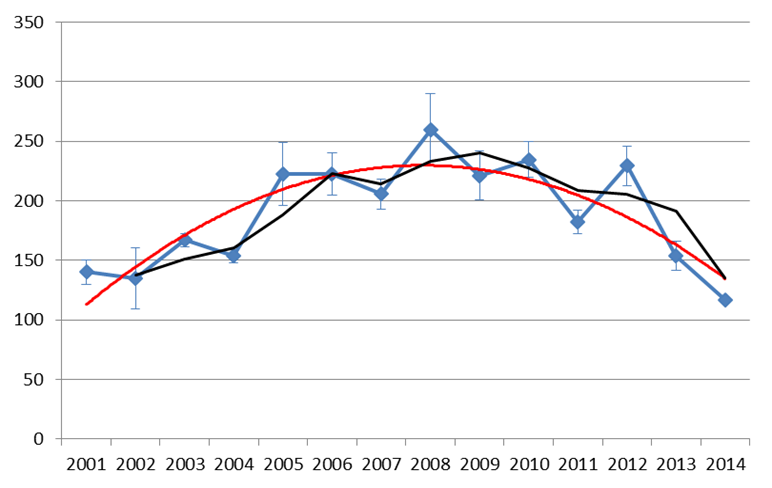 Figure 4: Bottlenose dolphin population trends in Cardigan Bay SAC (top) and wider Cardigan Bay (bottom). 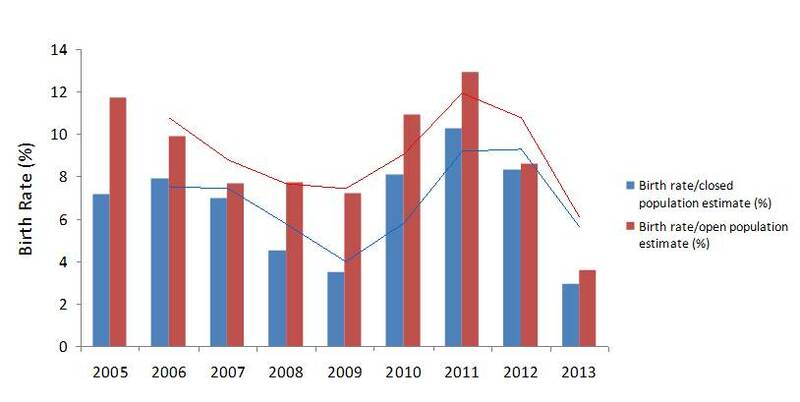 Blue line = whole population estimate, black line = moving average trend, red line = polynomial. 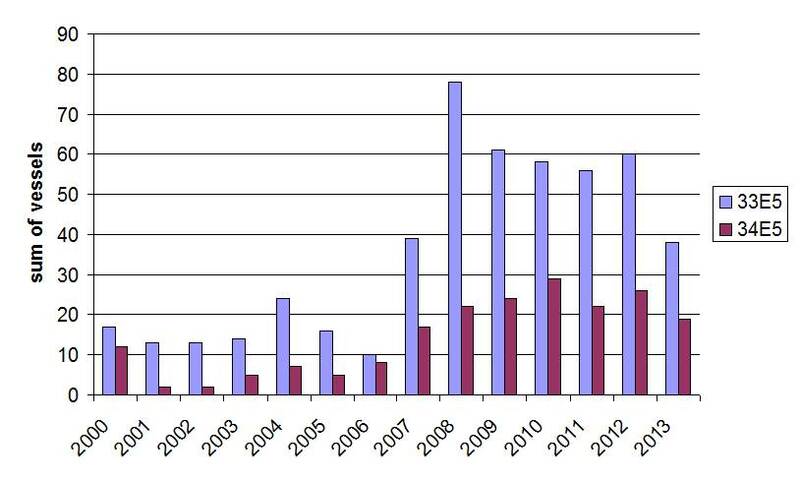 Figure 6 Number of scallop dredging vessels in Cardigan Bay (top) and tonnage of scallops collected (below). 33E5= southern Cardigan Bay, 34E5= northern Cardigan Bay. What conclusions can be drawn from the Bangor University experimental study of impacts of scallop dredging? This was a carefully designed experiment and showed little effects of scallop dredging on infaunal communities unless the area was repeatedly dredged. Effects varied somewhat according to substrate. The conclusions from the latest experiments suggested that natural forces such as wave action had a bigger effect than scallop dredging. However, for the very reason that NRW did not want the key areas for the dolphins to be disturbed, the experiments were conducted offshore in the western sector largely over gravel and pebbles (see figure 7). These areas may be relatively more affected by wave action than over mixed sediments with cobble reefs. Thus it would be prudent not to infer too much for impacts over the entire SAC. Can scallop dredging and dolphins co-exist? I believe they can, even within an SAC. Under the Habitats Directive, Special Areas of Conservation do not necessarily exclude other human activities but potential negative impacts need to be investigated and minimised, and if governments do not take such measures, they risk infraction proceedings from the European Commission. In the meantime, I would definitely advise against scallop dredging within not just the 3 nm coastal sector but the eastern part of the SAC out to 6 nm known to be important for the dolphins. And elsewhere, the intensity of scalloping should be carefully regulated. I recognise that if scalloping is restricted to a limited area, it will be unsustainable so either a larger area needs to be included, or the activity (which means its profits) should be limited. A balance should therefore be struck. 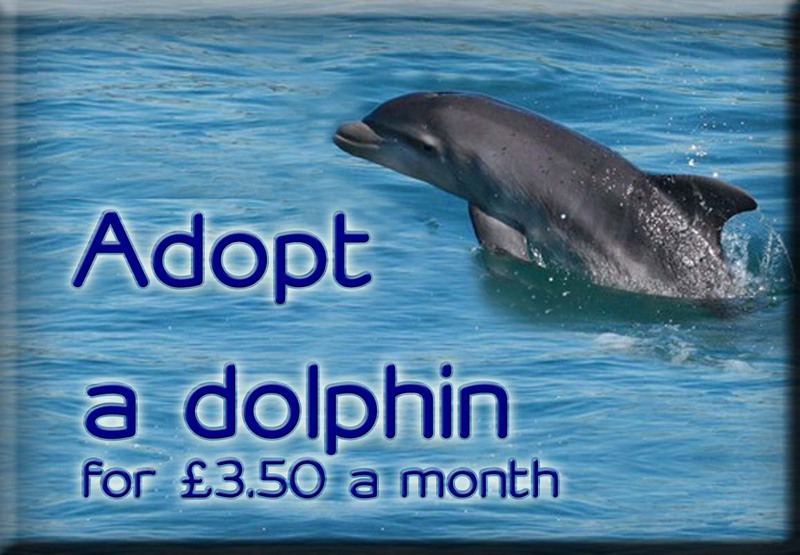 In this context, authorities should bear in mind that the overall annual income from dolphin-watching (direct through boat trips and indirect through purchase of food/meals, gifts and accommodation) is estimated to well exceed £3.5 million, and to involve >50,000 visitors to West Wales. Excellent post. Ι’m goіng through ѕome ߋf theѕe issues as well..
Scallop Dredging: does it damage protected dolphin habitats? Hi. Interesting information. 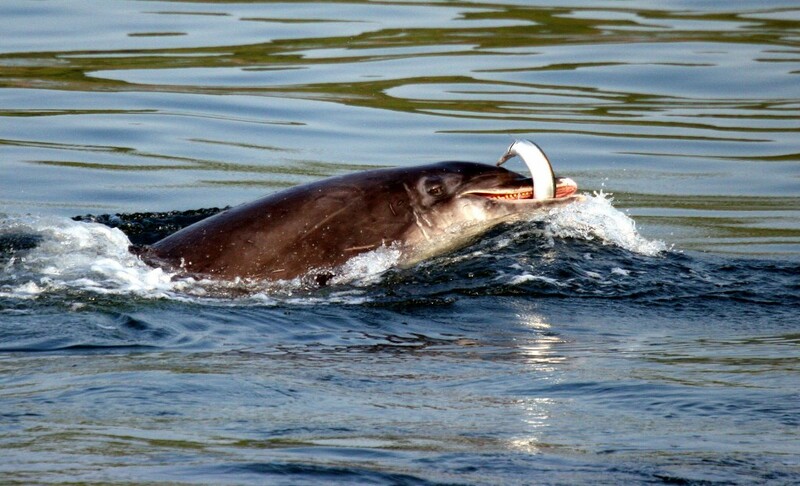 Looks like the bottlenose dolphin in the first image is eating a garfish not a conger eel. Hi Mike, at the time of the photograph (2006) the eel was identified as a Congor eel. Having said that, one cannot exclude the possibility that it is a European eel Anguilla anguilla at the stage when it goes back to sea given that the underside and flanks are more silvery than a conger eel normally is. Best wishes, Kathy.